A piece of Canadian history made its way to Willow Creek Composite High School. 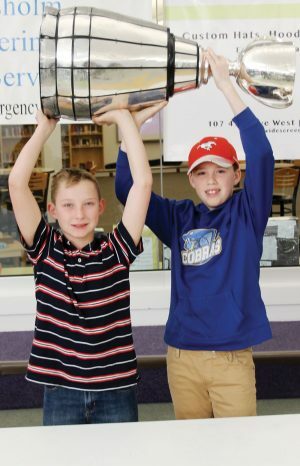 The Grey Cup, awarded to the champions of the Canadian Football League, was at the school on Tuesday, Jan. 15. The defending Grey Cup champions are the Calgary Stampeders and Mark Kilam, their special teams coordinator, brought the trophy for an hour for people to hold it and have pictures taken. Kilam is from Lethbridge, attending LCI and playing football there in the 1990s. He went on to play at the University of Alberta then joined the staff of the Stampeders in 2005 as a strength and conditioning coach. He became a coordinator in 2010 and is now in his 15th year with the team. “It’s been an awesome ride,” he said. 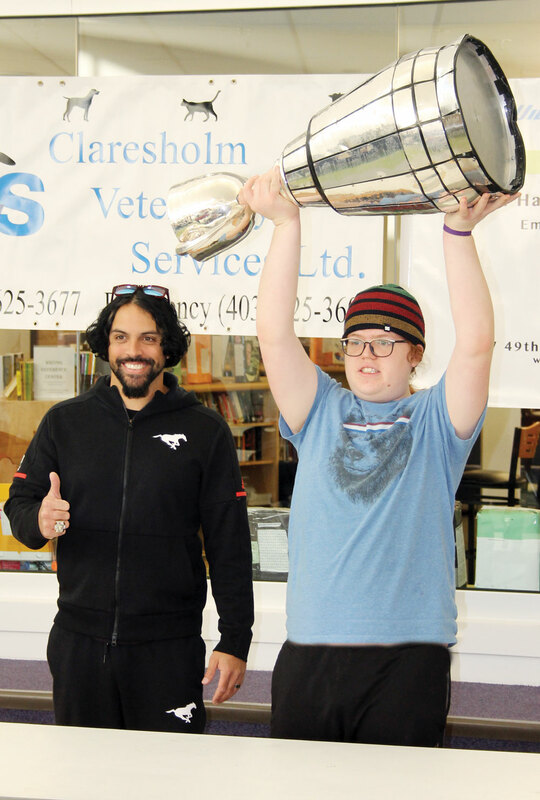 Kilam brought the Grey Cup to LCI on Jan. 14, and stopped in Claresholm on his way back to Calgary the next morning. He has a friend in town, Natalie Wright, who suggested he bring it to the school. Waiting for him and the Grey Cup were students and members of the community, there to get a chance to touch the trophy and take photos with it. Kilam observed one of the best parts is the history that surrounds the trophy. Every dent has a story. He is also happy with the reaction of people in the area who get a chance to hold the Grey Cup. “It’s neat for the communities, especially the smaller communities in Southern Alberta,” Kilam said.